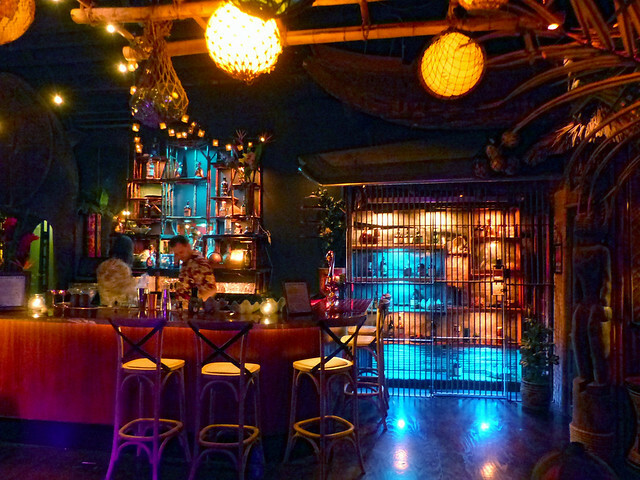 Los Angeles has some of the oldest and greatest tiki bars in the country, but the opening of Pacific Seas has still been much anticipated. (It’s officially on Saturday night!) 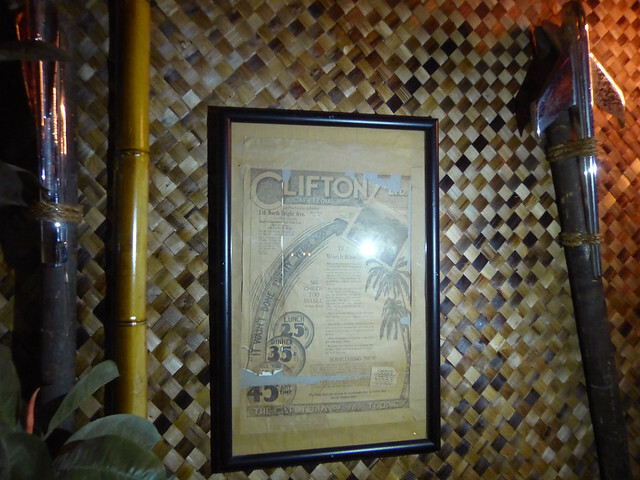 There was talk that a tiki bar would be part of the revival of LA’s historic Clifton’s since Andrew Meieran, the nightlife entrepreneur behind The Edison, purchased the last surviving location of the cafeteria chain in 2010. After undergoing a massive renovation, the multi-level bastion of kitsch and comfort food finally re-opened in Fall 2015 — but with no sign of a tiki bar yet. 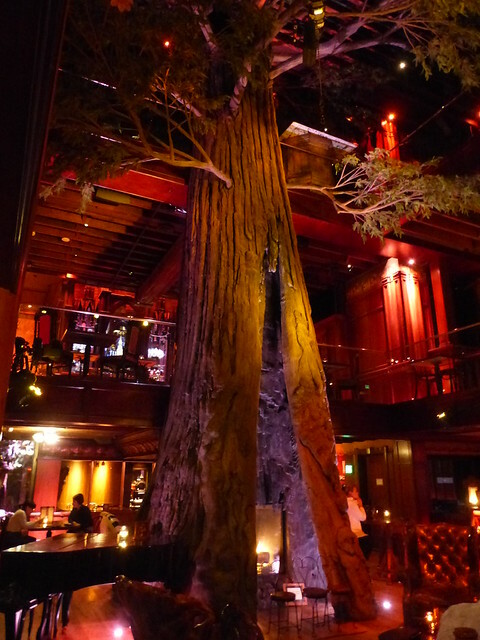 That didn’t stop Clifton’s from becoming one of my favorite places in LA, with its faux woodsy wonderland atmosphere (and Art Deco style mugs shaped like an owl and bear, manufactured by Tiki Farm and designed by The Pizz and Thor, respectively). I was lucky enough to attend a preview night for Pacific Seas last week. 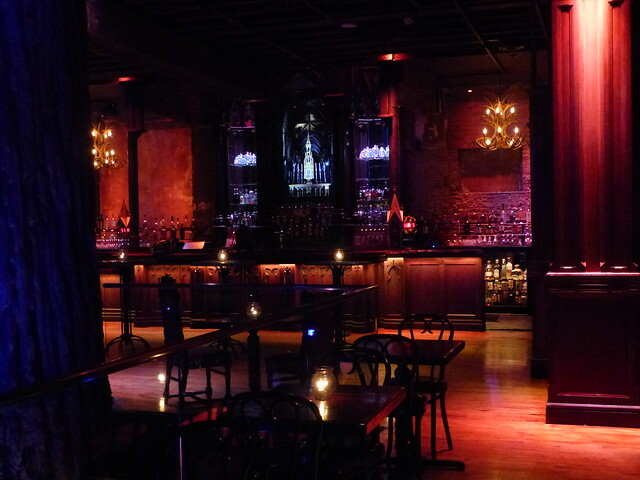 To get there, we were instructed to go up the staircase to the third floor that houses the moody Gothic Bar (pictured) and The Brookdale room, then seek out the speakeasy-style entrance “through the looking glass.” Once you venture past the mirrored door, you’ll continue up even more stairs and past a vintage phonebooth (for a second I thought it might be like the secret door at Tonga Hut Palm Springs, but no) to arrive in tiki paradise. The bar is named after the long-gone founding branch of Clifford Clinton’s “cafeteria of the golden rule,” where those suffering from the Great Depression could pay whatever they wanted for a meal (nothing, in many cases). 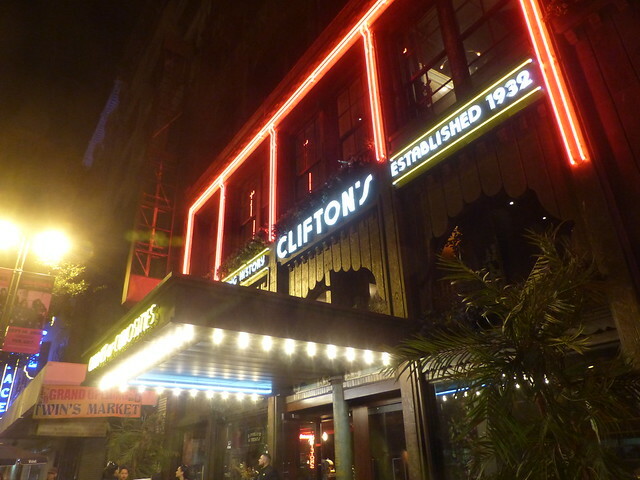 In 1939, that location was given a tropical makeover and dubbed Clifton’s Pacific Seas. 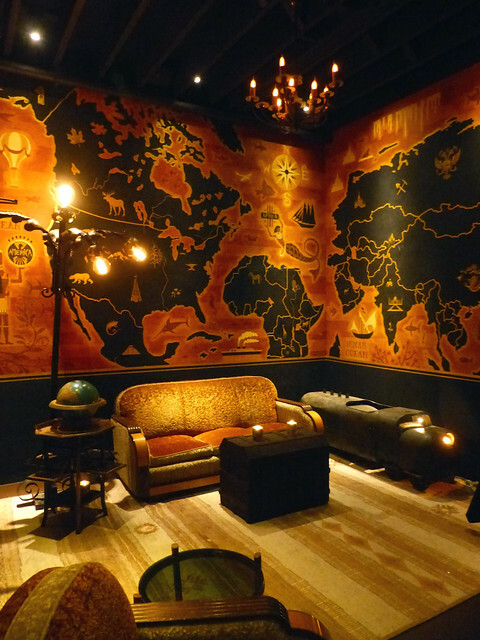 The first thing you’ll see in this modern tribute is the Deco Map Room, a “departure lounge” to this world of fantasy, featuring a gorgeous mural from Sammy Beam. 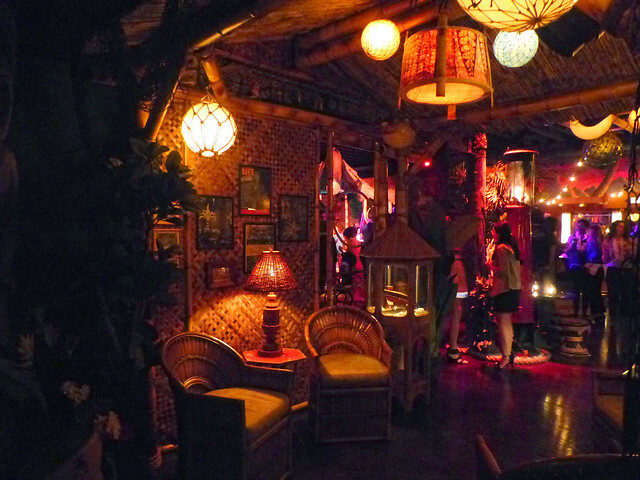 Responsible for putting all the pieces together was Bamboo Ben, who also outfitted the interiors for tiki bars such as Frankie’s Tiki Room in Las Vegas, Tiki No in North Hollywood and Forbidden Island in the Bay Area. With Pacific Seas, he’s really gone above and beyond. 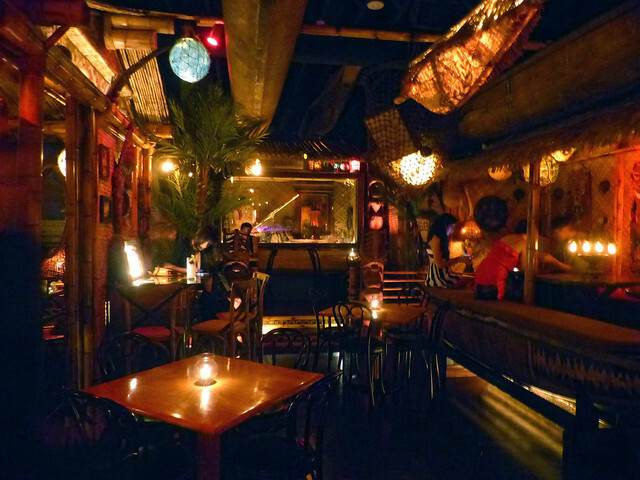 There are so many different carefully curated areas where patrons can settle in for a drink, from a table next to a shipwrecked boat on a rocky shore to the cozy “living room” (pictured) to the “chief’s hut” with an outrigger serving as a place for patrons to sit beneath the thatched overhang. 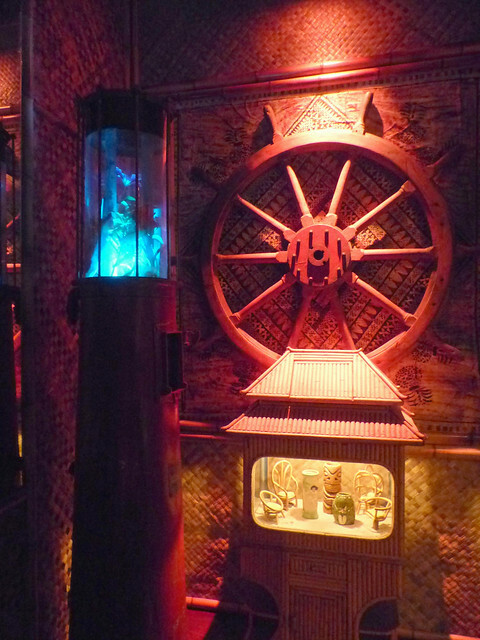 The décor is a wonderful mix of old photographs, advertisements and relics (like original plaques and a slit gong) from Clifton’s Pacific Seas, flotsam and jetsam collected by Meieran throughout his travels, more amazing murals from Sammy Beam, contemporary carved tikis from folks like Jason Joffe and Smokin’ Tikis, and clever custom creations from Bamboo Ben, such as these “spearheads” made from classic car hood ornaments. 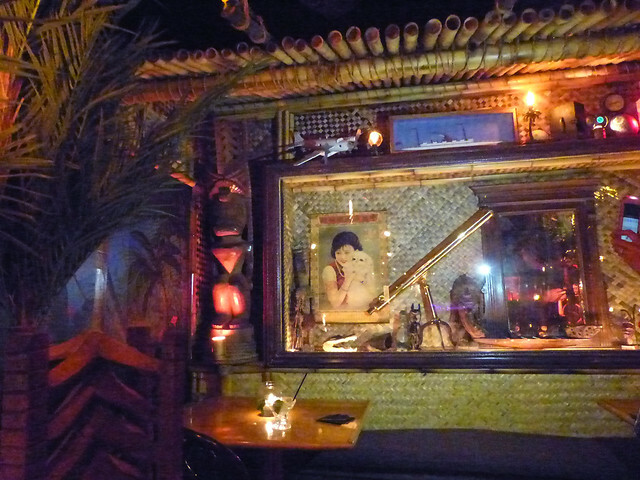 Bamboo Ben also crafted the display area behind the bar out of pieces of antique rattan and bamboo furniture. 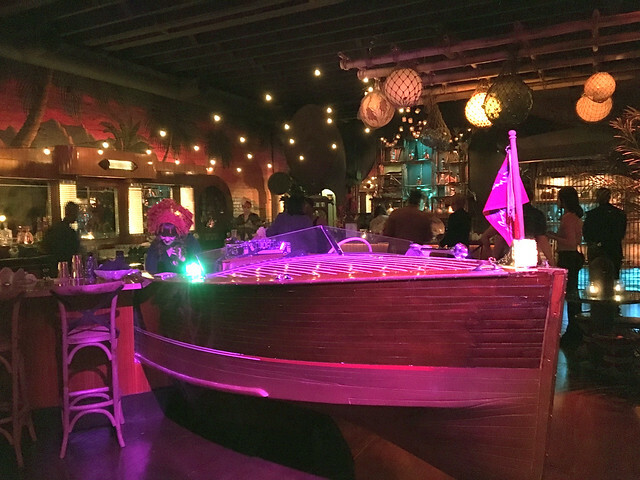 To the right of the bar is the jail (from one of my favorite dining nooks in Bahooka) that will store bottles of rum for regulars. If you take a closer look, you’ll notice that the top piece is actually the wing of a DC-10. Jutting out from the bar into the middle of the main room is an antique Chris Craft boat. A DJ was spinning tunes from it that night, and an acrobat showed off her balance skills on the foredeck. 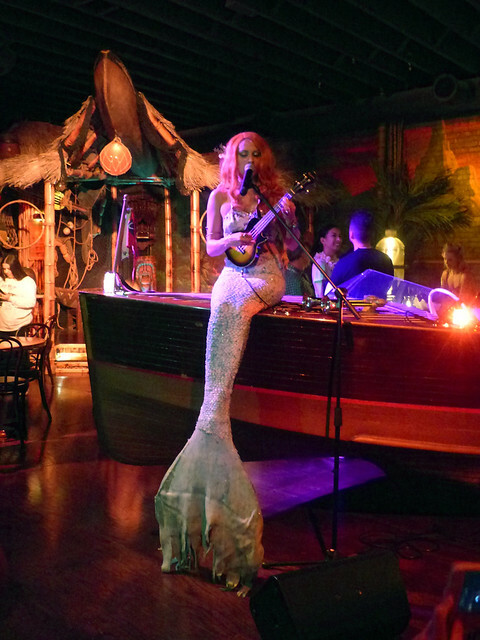 We were also entertained by Polynesian dancers performing on the stage as well as some artists from the avant-garde circus Lucent Dossier Experience, like this mermaid singing haunting tunes with a ukulele. At the cafeteria on the ground floor, diners can nosh on traditional turkey dinners and jello, but up here you’ll choose from a completely different menu that includes reinvented versions of shrimp cocktail and pupu platters, along with larger plates like poached Maine lobster stuffed with scallop dynamite and avocado. We sampled coffee-rubbed steak and diced yellowtail with avocado on a rice cracker, but I don’t see those listed on the full menu uploaded by Eater LA. For the media night, they offered three cocktails: Singapore Sling (gin, Cherry Heering, Benedictine, orange and Angostura bitters), Mai Tai (based on Trader Vic’s 1944 recipe with house-made orgeat, lime and Jamaican and Martinique rums) and Daiquiri (aged white rum with lime, apricot, cinnamon and orange bitters). 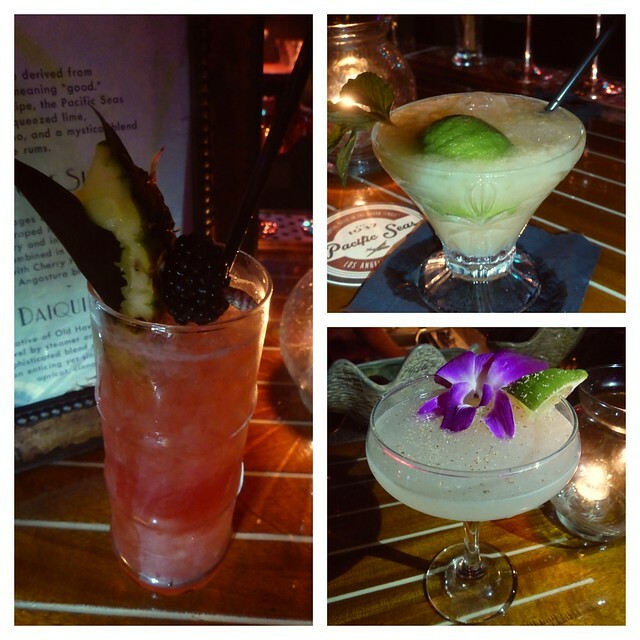 Other classic tiki tipples (Navy Grog, Fog Cutter, Painkiller) will also be on the menu alongside a few original creations, all priced from $12-$14, except for the $40 four-person Scorpion Bowl and Bird of Paradise (a riff on the Jungle Bird). I adore these Pacific Seas coasters evoking the golden age of travel. 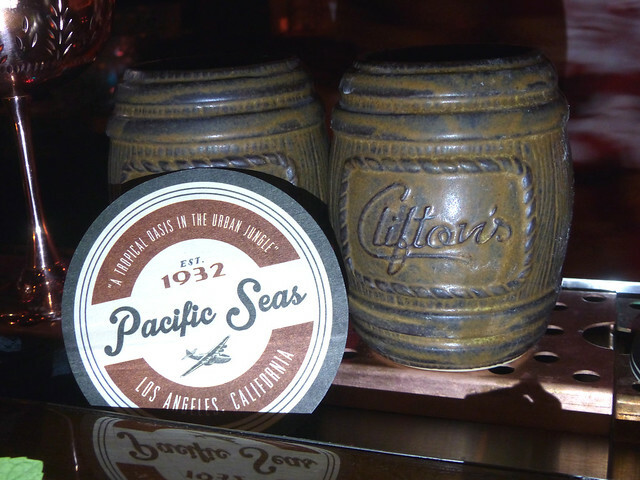 Ceramic fanatics will want to take note of the custom barrel mugs emblazoned with “Clifton’s” (made by Tiki Farm). There are clamshell bowls that are not exclusive to Pacific Seas (though they are stamped with the name). I also saw a slew of other recent Tiki Farm mugs behind the bar, including Pau Hana Honu by BigToe and Marqo-Coco and Nari Rani Tiki Mug by Flounder. One last thing: Keep an eye out for the pirate Blackbeard’s telescope in one of the dioramas! Pacific Seas officially opens November 12th, and the hours will be Tuesday and Wednesday 5 p.m.-midnight, Thursday through Saturday 5 p.m.-2:30 a.m. Reservations can be made for parties of 10 or more.